It is said sake began being brewed here from as long ago as 1631, and at its height there were nearly 30 different breweries here. Even now, in the districts of Koarai and Otazuki in central Kitakata, there are 10 breweries that support Kitakata's delicious sake industry. Why Kitakata sake is so delicious. The deciding factor in making Kitakata sake so delicious is the water that uses a generous amount of subsoil water from Mt. Iide. The heavy snowfall Mt. Iide receives slowly, over time becomes high quality soft water that flows into the city. In addition, the cold of winter that creates the high-quality subsoil water and the heavy snowfall are important elements in sake brewing. The chief brewers who work hard on a day-to-day basis with the goal of creating delicious sake have seen their efforts come to fruition, and now the whole of Fukushima Prefecture has become known for its sake. Since 2012, Fukushima has won the most Gold Prizes at the Zenkoku Shinshu Kanpyokai (Annual Japan Sake Awards) for six years running. Fukushima is the first prefecture to come in first place six years straight. Fukushima Prefecture has had the highest number of breweries win the Gold Prize at the Annual Japan Sake Awards for five consecutive years since 2012 and is currently breaking its own record. At the 2016 Awards, more than half of the Gold Prize winning breweries were sake breweries in the Aizu region, and of those, five breweries in Kitakata won the Gold Prize. In Kitakata, there is a toasting rule the entire region takes great pride in. Toasts must be made by pouring Kitakata sake into Kitakata-produced lacquerware. In the sake category at the International Wine Challenge (IWC) in 2015, the trophy for most outstanding brand among the gold medal winners in each category went to three Kitakata sake breweries. Furthermore, it was recognized as the No. 1 sake in the world when it was selected as the "2015 Champion Sake," which is selected from among the trophy winning brands in each category of the sake category. Their most well known brands are "Koderanni," "Sasukene," and "Najosunbe." Their dry "Suppetta Koppetta" is also popular. Their leading brand is "Kurashikku" (Classic), which is fermented while playing classical music. Their leading brand is "Kitanohana" "Kuradaiko" . Their leading brand is "Sasamasamune". Their leading brand is "Aizu homare". Their leading brand is "Yamatoya zennai". Their leading brand is "Yauemon". Their leading brand is "Yumegokoro" "Naraman". Their leading brand is "Yoshinokawa". Kitakata has a unique climate characterized by a large temperature difference. The area is also blessed with pure subsoil water running from the Iide mountains, high quality rice and the resources of the forest, which led to the development of the sake brewing and lacquerware industries here. In Kitakata, there is a toasting rule here that says toasts must be made with Kitakata sake poured into Kitakata lacquerware. 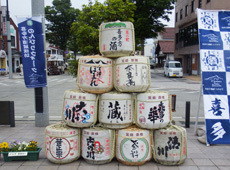 In addition, several sake events are held throughout the year here in this brewery town, and even today the people of Kitakata hold sake close to their hearts. The events are as follows.